Birthday Badges are available from us in a range of styles and sizes. The most popular sizes for our badges are circular with a diameter of 57mm or 75mm. We also have badges available that are rectangular and heart shaped. For children celebrating their birthdays who are 3 and under we can supply the badges with plastic safety clips. For all other badges the standard fastening is a safety pin, which is used to attach the badge to the clothing. Any of the birthday badges can be personalised. Designs range from basic ‘age’ badges, through designs with various clipart such as animals, birthday cakes, clowns, pirates and of course if you have a photograph then we can include this in the design as well. In all cases all we need to know is the age required (of course you can select a badge without a specific age), the name and any specific colours and text that you require. Hen night badges are the traditional accompaniments to the hen night. Whether the hen night is taking place in a bar, club, hotel or abroad then there needs to be the one thing that unites all the party goers, and the most popular solution is to arrange for hen night badges. We have a great range of hen night badges that can be customised with the bride’s name, the venue of the party and the date, and if required we can also add the name of each of the guests to the badges. This is an ideal addition and a great ice-breaker, if a lot of the people don’t know each other. You can choose from the range of designs and then personalise them, or design your own badge and send us the artwork or send us a photograph and will use it to create a photo badge design with your choice of wording. Stag Night Badges are available from us in variety of designs and sizes. The various designs are shown as examples of typical badges, and you can amend them as you wish, change the colours, add your own text and make them unique to your special night. The circular badges are available in two different diameters : 57mm and 75mm If we have the time, then we are always happy to send a mock-up of the chosen badge design before we start to produce the order. We also know that in many cases, things like stag night badges are often overlooked and then usually ordered on the last minute with delivery needed in 24 hours. Usually this isn’t a problem provided you are on the UK mainland and are available to sign for a delivery on the next day. On all last minute occasions we would suggest you call us first just to make sure. Our Baby Shower Badges are available in all colours – but the most popular are pink and blue. If you would like to have a rosette fore the Mum to Be and possibly the other members of the family or guests then please visit our baby shower rosettes page. Funeral Badges A selection of badge designs are available. You can use these as a basis and then just let us know how you would like to modify either the design, the layout, or the wording. There is no charge per word but remember that the badge is only 57mm in diameter. So there is a balance between the amount of text and the size that at which it can be read and printed. Funeral Badge designs Some of our designs contain basic designs and some have the option to upload a photograph of your loved one. These are only suggestions, so if you have an idea that includes a combination of designs , then just contact us. Just let us know the design you like and we can incorporate them into a personalised funeral badge for you. Once we have all the information from then we are normally able to despatch all orders within 24 hours. Birthday Rosettes can take a birthday badge to new levels. If you want to get something special for the birthday person then a rosette is a perfect gift. It offers a little more impact than a badge. the centre of the rosette is based on a 57mm badge., This means that you can personalise the birthday rosette just the same as you would personalise a badge, with all the same options for designs, colours and text, and of course a photograph. In addition to this you also have the option of choosing a rosette with either single, double or triple layers. All the rosettes are made by us with top quality ribbon in a box pleated format which gives one of the fullest types of fold, which gives a great appearance to the rosette. We have a wide selection of ribbon colours, so the choice is yours as to which colours you use for the layers and the tails. 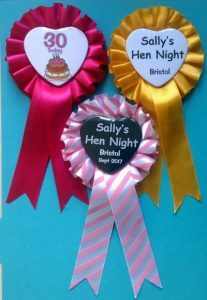 Our Hen Night Rosettes are based on the many different designs that we have for our hen night badges. If you want to make the hen stand out from the rest of party then the easiest way to do this is to get her a personalised hen night rosette. If the other member so the party are wearing badges then we can customise her rosette so that it reads something like ‘It’s My hen night’ and use the same colours as the other people’s badges. Of course you could also decide that everyone needs a rosette, in which case we can always put an extra tier of ribbon on the Bride’s. We always carry a good supply of different coloured ribbon so we can customised the hen night rosette with any combination of colours for the various tiers of the rosette. If require3d we can also print the tails on the rosette. Stag Night Rosettes can be quickly produced to your design requirements. The centre of the rosette is based on a 57mm diameter badge. The designs that are available are shown on the web site. All you need to do is decide which designs you prefer and then let us have the wording and colour scheme that you want for your rosette centre. The rosettes are produced in-house by us, so we can make them with whatever combination of ribbon colours you require. So the colours could match a colour scheme for a favourite club or football team. If you wish you can have the names of the individual guests on either the centres of the stag night rosettes or on the tails. The rosettes are available with one, two or three layers of ribbon. You can also select the number of, and the colours of the rosette tails, and have them custom printed if required. See below for details of our range of Baby Shower Rosettes Our custom party wear products for baby showers include badges, rosettes and sashes. Our Baby Shower Rosettes are available in all colours – but the most popular are pink and blue. The rosettes can be produced in one, two or three tiers of ribbon. Any combination of ribbon colours is possible. The rosettes can be different colours. The layers in multi-tiered rosettes can be any combination of colours. Typical designs for the centres of the rosettes are shown on the other pages in this category. If required we can also supply the centres of the rosettes as just badges, which would be a cheaper option if you are on a tight budget. Please contact us for a quotation if you require just badges. Whether you opt for rosettes or badges, then you can have a rosette just for the Mother to Be, or you could expand this to include other family members. Here you could have ‘Grandma to be’, ‘Auntie to be’ , ‘Big Sister to be’ or whatever combination of names you wish. Of course you can also expand the range to include all guests at the party. If you are looking for a rosettes that is slightly different to the norm, then we have the solution. Our new rosette designs incorporate a heart shaped centre, which give the rosette added appeal, in particular for birthdays and hen nights. Of course they can always be used for all kinds of occasions where the traditional circular centred rosettes would be used Most of the designs that we show, for any occasion, can be amended to the heart-shaped format. Just contact us with your design requirements. The prices for these new rosettes are the same as the ones shown on our web site for the circular versions. Baby Shower Sashes We print our own Baby Shower Sashes, so you can be assured of a quick delivery. Just select the colour of the ribbon that you require and let us know the wording you require on the front of the sashes. We can also print on the back or on both the front and back. For baby showers, normally it is just the front that we print. But this can easily be adapted to suit your requirements. If you require printing on just the back of the sash, then you can access our general party sash pages here. If you require print on both the back and front of the sash then click here. For print on just the front (which is the most popular option) then use the image links below, and then all you need to do is tell us the wording that you require on your baby shower sashes. Our personalised ribbon can be supplied in widths of 15mm, 25mm, 45mm or 100m. This makes it ideal for gift wrapping, wrapping around wedding cakes, decorating a wedding car or making a simple banner. For specific applications such as campaign ribbons or lapel ribbons, then please use the link below. For sashes, then please use the link to our sash page. So, you have a wedding, engagement, birthday or party coming up in the coming months. You need to tell people, and to make sure that they save the date free in their diaries. You could send them an invite via snail mail, you could send them an e-invite. But there is a better way. Every house has a fridge, so there is no better way to remind people of the date of your wedding than by sending them, or giving them a fridge magnet – or better still of popping the fridge magnet on the door of the frdge yourself. The fridge magnets are based on a 57mm badge, but with a magnet on the back instead of a safety pin. There are standard designs which we can adapt and develop to incorporate your theme and message. Just let us know the key details – names and dates and you will soon have your ‘keep the date frdge magnets’ to distribute to your friends. If you are looking for a rosettes that is slightly different to the norm, then we have the solution. Most of the designs that we show, for any occasion, can be amended to the heart-shaped format. Just contact us with your design requirements. The prices for these new rosettes are the same as the ones shown on our web site for the circular versions. Special One for the Bride? If you want one of your badges or rosettes with different wording for the Bride then just yell us in the comments section of the order. There is no extra charge. For most badge and rosette deisgns you can add the names of your guests to your personalised badge design. On the designs where this is an option, a smaller image will be displayed to show how it will look. To add guest names, please ensure the 'guest names check box' says 'yes' and a new text box will appear. Add the names, separate them by commas. If you do not require guest names then just leave the 'Guest Name' box as 'no'. We hope you agree, and accept the cookies.